Cigars On The Porch: Tagged Again! What was the best Christmas present you got as a kid? In high school I got some really kickass black cowboy boots. What was the best Christmas present you got as an adult? I have to go with this year's present - a new furnace and heating system that rocks. What’s your favorite Christmas carol? John Denver and Rowlf singing Have Yourself A Merry Little Christmas is my all-time favorite. I heart the Muppets and John Denver. How long can you stand to listen to Christmas music before you break? A remarkably long time. I have over 350 Christmas songs on my ipod and get new CDs each year. I'm a Christmas music whore. Everything from South Park's Merry F*&%in' Christmas to Bing Crosby's White Christmas, Lena Horne's What Are You Doing New Year's Eve to Pete Yorn's Do They Know It's Christmas - I love Christmas music, and I'm not too proud to admit it. Did you ever go caroling as a kid? No - we lived in the boonies. We didn't even trick or treat. Would you willingly eat fruitcake? It's actually not bad toasted with butter, but I haven't had it in years. Do you own any Christmas sweaters? Nope. Do you own any Christmas jewelry? What? I used to have a Santa pin, but I'm a slob and can't find it anymore. Did your family have any Christmas traditions? Like what? Christmas Eve we'd have eggnog and read 'Twas the Night Before Christmas and the Bible Christmas passage (Luke something-or-nother) with our parents in front of the fireplace. Very Norman Rockwellish, and I loved it (except the whole Bible part about being great with child - that always gave me the heeby-jeebies). On Christmas morning, we were allowed to open our stockings, but the tree and presents were shut off in another room. We had to wait for our tired parents to get up, finish our breakfast, and march into the living room youngest-to-oldest to see what Santa brought. And Santa never wrapped (with four kids, would you? ), so we each had a section under the tree that was all ours. That was awesome. Do you buy Christmas presents for your pets? I made stockings for the cats, but we never put anything in them. What’s your favorite Christmas cookie? Yes. What’s your favorite Christmas candy? I do enjoy those peppermints that dissolve really quickly...not like candy canes, but kind of powdery...? 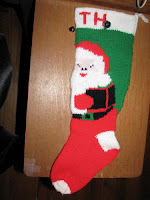 What’s your stocking look like? My mom knitted this when I was a wee one. All the kids have them. It hold lots of stuff, and it has jingle bells near the top. Santa's beard used to have a kind of silky fluff to it, but that's faded over the years. 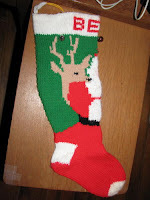 I love this stocking. How do you feel about the “Steal from Your Neighbor” Christmas present game (the one where people pick gifts from a pile, but others get to steal it)? I'm not fond of any reindeer games. What is the oldest ornament on your tree? I have some from my grandmother - small porcelain elves and old-fashioned lights that are shaped as fruit. I don't really put them on the tree anymore, since I have cats. Real or artificial? Artificial is not an option. Sometimes we don't have a tree, though, like this year - just depends on how much we put into decorating. How do you feel about Christmas letters? They're a great way to keep in touch. I'm not fond of the "I lost my job, our dog died, and grandma has an incurable disease. Merry Christmas!" kind. Do you have Christmas decorations or lights outside your house? What are they? Pretty much just white lights on the house, wreaths and bows. As seen here. And we won a prize! How far would you drive to see Christmas lights? It's not a priority. Are you a fan of tasteful or tacky? I think they both balance out the universe. 23. Annie added this one: Do you have any Christmas collections? Certain ornaments...our favorite potter comes out with a new one each year, and my mom has given us one as a present every year since we got married. Also, a local business commissions a new ornament around an historic Montgomery building each year - so now, no matter where we end up, we can take our beloved village with us. 24. Do you travel to celebrate Christmas? Sometimes, since our family is all far away. But I prefer staying home.